Hi, everyone. I thought I would write a quick post in reference to Colors of Us. I just wanted to answer your questions and thank you for your kind comments. 1. Yes, I am thinking about publishing the book. I'd really like for the parents to be able to have a quality copy to keep. I've already downloaded the Blurb software and made a plan for a more sophisticated version of the conversation pages. Scholastic has a program called Kids Are Authors. It is a competition, and the winners have the book printed by Scholastic and sold at school book fairs around the country. I'm checking into that, too. 2. What do you think? Would people be interested in purchasing the book from Blurb? It would cost $20.00 a copy plus shipping. That seems pretty steep for a paperback children's book. It also seems like a wonderful way to share this with my students' parents and grandparents, or whoever else might be interested. Does anyone have any alternative publishing suggestions? 3. Yes, I did teach them how to mix the paints for their hair and their skin. Most of the kids turned out darker than they really are. I wish I had pictures of the class holding their arms up to the paper plate that served as their palette. 4. As I was planning the book, I knew that I would have 18 different artists in one book. To make it look uniform, I limited the background and shirt colors to four options. Each student could choose from yellow, blue, red, or orange for the background. They could choose one of the three remaining colors for the shirt. If they wanted to add shirt details, the same color choices applied. I think it really worked. 5. We had a lesson on fractions, too. Thirds specifically. I taught the class to divide their oval into thirds before sketching the face. We drew the facial features on to the painted faces with light pencil lines. When they were right, we went over them in Sharpie. The whites of the eyes and the teeth are white paint. The paper is a little bigger than an 8 x10. Parents could use a standard mat and frame for it. I am hoping they will want to hang them at home in a place of honor. 6. Yes, all of the artists are seven or eight years old. Amazing, isn't it? I wish you could see how good the originals look hanging in the hall. I've never seen so many students stop and read a hall display. It makes me giddy. 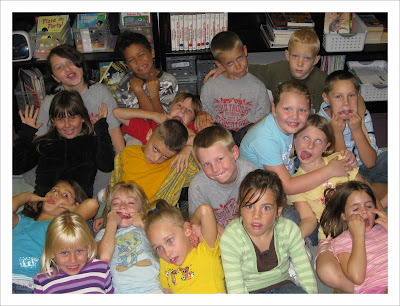 The photo is a picture of my class. Can you guess which child matches each self-portrait? Gosh, I really love this project and I'm excited you are exploring ways to make it available in book form for parents. Personally, even on a tight budget I would figure out a way to handle that amount of money. I think it would be worth it for a professional looking keepsake like that. I had never heard of blurb...I'm thinking of getting my son to put some of his stuff together and make a blurb book! The only other one the might be worth checking into is shutterfly.com. I don't think it's any cheaper though. I don't know enough to compare. I was wondering how you got the paintings to look uniform! Great job! I am just thinking aloud, since this book is about celebrating diversity and inclusion, would any corporate body be interested in sponsoring the publication as a part of its CSR initiative? I know it is easy to say this, but perhaps it could be an idea you could explore. I have not yet uploaded a book, am busy reading the ones up there. All the very best for this project. P.S. I love the sponsorship idea! Don't second-guess your local businesses. I just did an entire festival around Christmas and managed to pull the thing off for ZERO dollars and managed to feed at least 100 people for free! All donated products and supplies. I'm guessing your project will be around $500 from what you describe. Even getting half that will bring the books down to $10 each which will be easy for most parents. I bet you could get AT LEAST two to three local businesses to kick in. Also, don't forget the power of the press. Contact your local newspaper to do a story on what you're trying to accomplish and I bet you'll get some donors there, too. Wow! You guys are so encouraging. Thank you. You have given me much to think about and to explore. Wendy, I added the answer to your question to my updated post. Hi~ Love the picture- Yes- absolutely try the book publishing idea! Even if it's not published professionally (if you can't swing that) even color copied and bindered you could sell it for a lot less and the kids could have their copies. I love how you made this a cross-curricular project. How fun! And I'm sure a lasting memory for the kids! The book idea is wonderful! I used lulu for calendars for Christmas and I was pleased with them! You know how much I love this!!! My favorite idea is to contact the local newspapers. Our daily free newspaper is always hungry for material; especially if it's already written for them, complete with photos. You can just point them to these two posts. Another idea is to ask people to sponsor either partial or full scholarships for the students. If a quarter of the parents gave an extra five dollars, more kids would be able to afford this book. I'm sure you are familiar with "The Watson's Go to Birmingham - 1963". It is my all-time favorite multi-cultural book. Oh I hope you do publish it. what a great group, and so talented. Go for it! Jim published a book on Blurb (did I ever show it to you?). I think it's a super idea, and since I've seen this project up close and personal, I believe you have a very good chance of winning! i love how you also taught them to mix their paints and limited their colors so that the book would have a uniform look. I was thinking you must have been their guide. looks like a fun class. I think I'm on the same page as patti... if you want to make the book without spending much money. You can make the colored copies at kinkos and they will bind the books with the coils....very cheap if the other ideas fail due to the pricing.